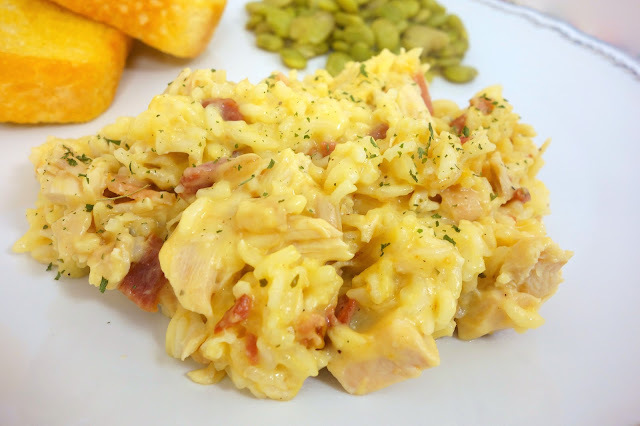 Baked Cracked Out Chicken and Rice recipe - chicken, cheddar, bacon, ranch, rice, cream of chicken soup and milk. Mix together, cover and bake. Ready in about 30 minutes! 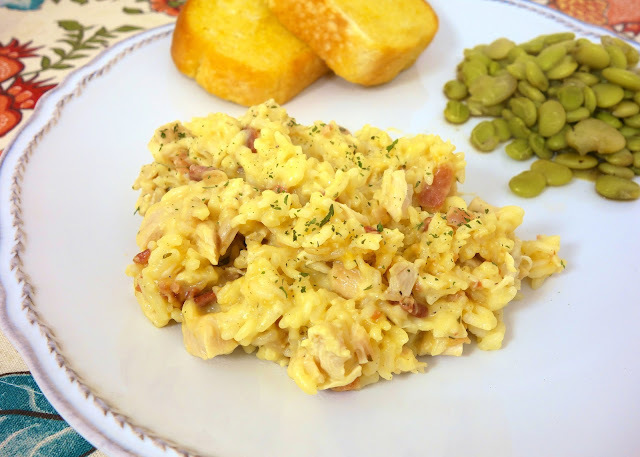 Everyone LOVES this super easy weeknight dinner recipe!! This is no ordinary Chicken and Rice. This is "Cracked Out" Chicken and Rice - chicken, rice, cheddar, Ranch and bacon. YUM! This takes ordinary chicken and rice from good to great! We absolutely loved this dish. How could we not? It is so delicious and super simple to make. I used my weeknight dinner secret weapon - rotisserie chicken - at it came together in minutes. I had it ready and waiting when the oven was finally preheated. To make sure the rice gets cooked thoroughly and doesn't burn on the bottom, I stir this about half way through the cooking time. Turns out perfect every time! Preheat oven to 375ºF. Lightly spray a 9x9-inch pan with cooking spray. Combine all ingredients and pour into prepared pan. Cover dish with foil. Bake for 35-40 minutes, stirring midway through cooking time. Campero - no, do not cook the rice first. Wonder if brown rice would work in this recipe? Yumm!! Looks great! :) Definitely something we would enjoy - saving this one. justanotherperson - it is cooked chicken. I updated the recipe. Thanks! I need this, like I need it right now! I would totally eat all of this haha, I know this recipe is fabulous! Love it! It’s been along time since you asked this question, so I’m not sure if you’ll see this reply. Lima beans, or as we sometimes call them, butter beans, are my favorite vegetable. I cook mine in water with a couple of chicken bouillon cubes added. You can also add a little bacon grease which makes them really good. I buy mine frozen and just simmer them until they’re done. They should be soft. Hope this helps. Your recipes are always the best! Definitely will give this a try. My favorite of yours is the chicken dish with the orange marmalade. I was hurting for dinner stuff too, going to make this tonight! Thank you Stephanie, will try this soon. Love me some crack ANYTHING! Can't wait to try it Steph! Wow! This looks great! I love chicken and rice but you really did it with this recipe. I can't resist the bacon, ranch and cheddar. Definitely going into my weeknight rotation! What would happen if you did use Minute Rice? I have a ton of it but no regular rice. Marissa - you would need to cut the cooking time way down. I would check it at about 15 minutes and then every 5 minutes until done. Would you still use 1 c. of milk? Emily - I use either Mahatma or Publix long grain white rice. I have never had an issue with the rice not cooking. I make this and a version of this dish all the time. Hey jamee, I was planning on cooking this with already cooked rice. Did you still use 1 c. of milk even though you used minute rice? Just got done making this with minute rice and cooked it for 40 minutes. Checked it at 20 and 30 minutes, but 40 was perfect! Yum! I made it with pre-cooked instant rice, otherwise followed recipe, and it turned out good. Hey Susan, I was planning on cooking this with already cooked rice. Did you still use 1 c. of milk? I wonder if those who are not getting good results with the baked version are not tightly covering their baking dish? If not, the moisture needed for the rice is going to evaporate and not cook. I made this and it was amazing! I followed the instructions to the mark and at 40 minutes, my rice was still hard as rocks... it took nearly an hour and 1/2 to cook the rice (I had to continuously add more water/milk), and it was still a little 'al dente' but we were so hungry at that point, we didn't care. I was picking rice out of my teeth the rest of the night. I think I only had an 8x8 metal pan... I think next time, I'll at least par-boil the rice. The flavor was delicious!! Very good! It will be making a comeback at my house soon. So I want to try this and from what I see its very good... My only question is how many people does it feed for? It will feed about 4 - just depending on what you serve with it and how hungry people are. The flavor is amazing but my rice came out so hard. Is 1 cup of milk enough to cook 3/4 cup of rice? I made this tonight. I cooked per directions for 40 min. Took it out and stirred and tasted, rice was still not all the way cooked. I added a little chicken broth, turned the oven up to 400, recovered and cooked an additional 15 min. Turned out delicious! By the way I did stir at the half way point also. So, do you have any nutritional info on this recipe? What if I didn't know the chicken had to be cooked and I did it raw will it still work?